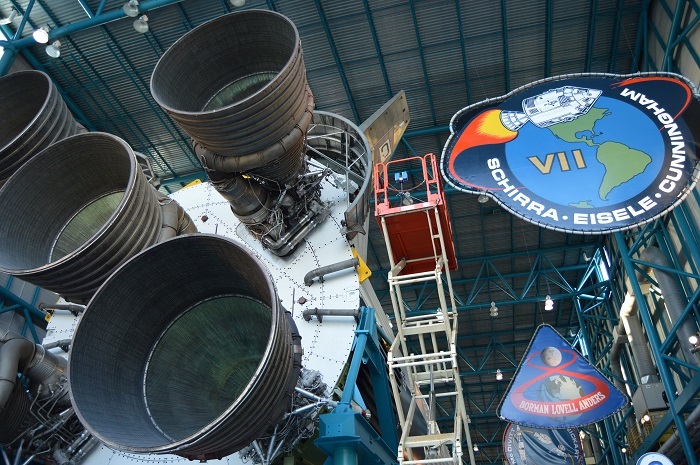 The Saturn V was a 363 ft. rocket utilized to launch the Apollo lunar landing missions. 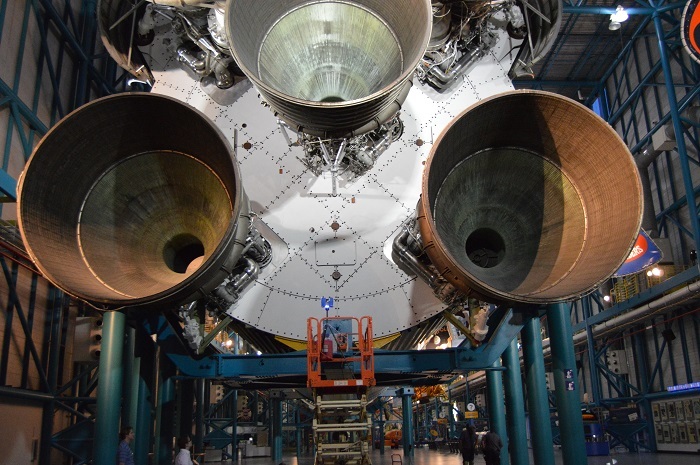 This page addresses the laser scanning of the Saturn V at the Kennedy Space Center by the ChronoPoints project at the University of Central Florida. In November 1967, the Saturn V would take its initial step toward the lunar surface with the launch of Apollo 4. The five F-1 engines in its first stage generated in excess of 7.5 million pounds of thrust that enabled the 363-foot high test vehicle to rise from Launch Complex 39A at the Kennedy Space Center (KSC). CBS journalist Walter Cronkite’s coverage of the event would convey the immense power of the Saturn V as his broadcast booth shook and the excitement in his voice was evident. This vehicle would permit humanity to first break the bonds of Earth with Apollo 8 and subsequently walk upon the lunar surface six times. 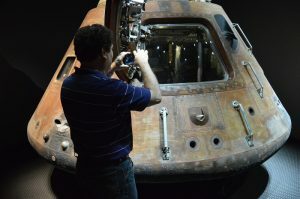 With the cancellation of the final three lunar landing missions, one of the Saturn V vehicles would be converted to launch the Skylab space station. 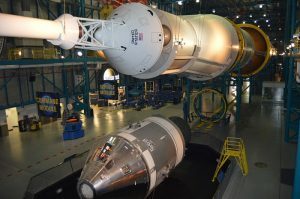 This would leave two Saturn Vs (SA-514 and SA-515) and the third stage of SA-513 that was not needed as the Skylab station would comprise the third stage for the Saturn V used to place the station into orbit. Three Saturn V vehicles are displayed one each at the Kennedy Space Center, Johnson Space Center and the United States Space & Rocket Center. The Saturn V at KSC is comprised of a test version of the first stage and the second and third stage of SA-514. ChronoPoints laser scanned the Saturn V display at the KSC Apollo/Saturn V Center, the Apollo 14 capsule, astronaut transfer van and a portion of the Launch Umbilical Tower. Note the size of the FARO Focus3D X 330 scanner on the scissor lift in comparison to the F-1 engines on the first stage. ChronoPoints would like to thank Delaware North at the Kennedy Space Center Visitor Complex and FARO.